Auto body shop owners and technicians who missed the April SCRS presentation on personal protective equipment will want to catch the replay posted Friday on YouTube. 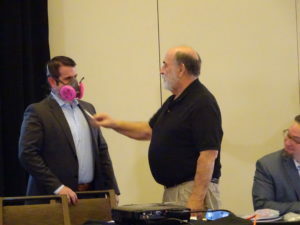 Improper or nonexistent PPE usage can lead to employee illness or injury and employer OSHA penalties, according to SCRS education committee Co-Chairman Toby Chess (Kent Automotive). OSHA’s General Duty Clause imposes a federal responsibility on bosses to protect their workers. Watch the video captured during the Society of Collision Repair Specialists open board meeting here, see Chess’ slides here, and read an article on some of its highlights here. Isocyanates aren’t just a threat to painters. Isocyanates can be found in refinishing products — but they’re also in substances like body filler, seam sealers, and many two-party products, according to Chess. If the shop owner’s not aware of the threat, they might leave their body technicians exposed to the potentially debilitating chemicals without any thought to adequate protective equipment. OSHA fines over the substances spiked in 2016 to reach even $10,000 for “minor infractions,” Chess said. Respirators must have a test fit. A shop must perform a test fit of any respirator and keep that test current, or “they’ll shut you down,” Chess said. The fine for a failure to test-fit a respirator is now above $10,000, he said. Bearded or overly mustachioed employees might be an OSHA violation ready to happen if the facial hair prevents a respirator from forming a tight enough seal. Protect your ears. A door skin air hammer makes around 130-135 decibals of noise, according to Chess — who called it louder than a commercial jet. That’s so loud OSHA considers it dangerous even for a tiny duration. Yet a technician might omit ear protection. Don’t forget to make plans to attend SCRS’ next open board meeting, scheduled for 8:30-10 a.m. Aug. 7 in Room B403 of the Georgia World Congress Center in Atlanta during NACE and CIC week. The event is open to anyone interested.